Luciano Pavarotti (October 12, 1935 – September 6, 2007) was an Italian tenor and one of the most popular contemporary vocal performers in the world. He not only sang in opera but also in other kinds of music. Known for his televised concerts, media appearances, and as one of the "Three Tenors" (the other two were Plácido Domingo and José Carreras). Pavarotti became enormously popular after a performance of the aria Nessun Dorma from Puccini’s opera Turandot for the opening ceremony of the 1990 FIFA World Cup in Italy. Pavarotti was also well known for his award-winning charity work for raising money on behalf of refugees and the Red Cross. Luciano Pavarotti was born in Modena in north-central Italy. His father was a baker who also liked to sing, his mother worked in a cigar factory. The family did not have much money. During World War II they lived in the countryside on a farm. Pavarotti started to listen to his father’s recordings of famous tenors of the day such as Beniamino Gigli, Giovanni Martinelli, Tito Schipa and Enrico Caruso. At around the age of nine he began singing with his father in a small local church choir. He was a normal boy who liked playing football and even thought of being a professional soccer goalkeeper, but his mother said he should be a teacher. His father said he would continue to support him, but once he was 30 years old he would have to earn money to support himself. Pavarotti began singing lessons seriously in 1954 at the age of 19. He met a singer called Adua Veroni. He married her in 1961. Pavarotti had to earn money, so he became a teacher, and then an insurance salesman. For several years he just gave a few recitals without being paid for them. Then he had problems with his throat and stopped singing for a short time, and, surprisingly, this helped his voice to become really good. Pavarotti made his opera début in the role of Rodolfo in La bohème by Puccini on April 29, 1961 in the town of Reggio Emilia. Soon he was singing in: the Vienna State Opera. He sang in the United States with Joan Sutherland. In 1965 he sang at La Scala, probably the most famous of all opera houses. He was singing in the famous Franco Zeffirelli production of La Bohème, with Mirella Freni singing Mimi and Herbert von Karajan conducting. . His first appearance as Tonio in Donizetti's La fille du régiment took place at Covent Garden on June 2 of that year. It was his performances of this role that made people call him the "King of the High Cs" (The note C above Middle C is a very high note for a tenor to sing). Pavarotti learned many more operatic roles and sang all over the world. In 1972, he sang in a production of La fille du régiment by Donizetti at the Metropolitan Opera in New York. The audience were amazed when he sang nine high Cs. They applauded so much that he had 17 curtain calls. He sang the role of Rodolfo in (La bohème) in the first Live From The Met telecast in March of 1977, which attracted one of the largest audiences ever for a televised opera. He won many Grammy awards and platinum and gold discs for his performances. In 1976 Pavarotti sang at the Salzburg Festival appearing in a solo recital. He returned to the festival in 1978 with a recital and as the Italian singer in Der Rosenkavalier, in 1983 with Idomeneo, and both in 1985 and 1988 with solo recitals. In 1977 there was a cover story in Time Magazine about him . That same year saw Pavarotti's return to the Vienna State Opera where he had not been for 14 years. With Herbert von Karajan conducting Pavarotti sang Manrico in Il trovatore. In 1978, he appeared in a solo recital on Live from Lincoln Center. He made his international recital début at William Jewell College in Liberty, Missouri in 1973 as part of the college’s Fine Arts Program, now known as the Harriman-Jewell Series. Perspiring due to nerves and a cold, he kept a handkerchief in his hand all the way through the concert. The handkerchief was often associated with him after that during his solo performances. At the beginning of the 1980s, he set up The Pavarotti International Voice Competition for young singers, performing with the winners in 1982 in excerpts of La bohème and L'elisir d'amore. The competition gave young people a chance to start their singing careers. It was repeated in 1982. They even travelled to China. In 1992 Pavarotti sang in La Scala in a new Zeffirelli production of Don Carlo conducted by Riccardo Muti. Pavarotti's performance was heavily criticized by some observers and booed by some of the audience. The singer never returned to La Scala again after that. Pavarotti became even more well-known throughout the world in 1990 when his sang Giacomo Puccini's aria, "Nessun Dorma" from Turandot which was used as the theme song for the BBC TV coverage of the 1990 FIFA World Cup in Italy. The aria made him a kind of pop star and it remained his trademark song. This was followed by the hugely successful Three Tenors concert held on the eve of the World Cup final at the ancient Baths of Caracalla in Rome with fellow tenors Plácido Domingo and José Carreras and conductor Zubin Mehta, which became the biggest selling classical record of all time. The high point of the concert happened when Pavarotti sang a famous part of di Capua's "'O Sole Mio". Domingo and Carreras copied him and the audience enjoyed it very much. This was one of the most remembered moments in opera of our time. Throughout the 1990s, Pavarotti appeared in many big outdoor concerts, including his televised concert in London's Hyde Park which drew a record audience of 150,000. In June 1993, more than 500,000 listeners gathered for his performance on the Great Lawn of New York's Central Park, while millions more around the world watched on television. The following September, in the shadow of the Eiffel Tower in Paris, he sang for a crowd of about 300,000. Following on from the original 1990 concert, Three Tenors concerts were held during the Football World Cups; in Los Angeles in 1994, in Paris in 1998, and in Yokohama in 2002. Pavarotti's rise to stardom was not without occasional difficulties, however. He got a reputation as "The King of Cancellations" because he often cancelled performances, and this made him unpopular with some opera houses. In 1998, Pavarotti was given a very special award: the Grammy Legend Award. In 2002, Pavarotti split with the Herbert Breslin, the man who had been his manager for 36 years. On 13 December 2003 he married his former personal assistant, Nicoletta Mantovani, with whom he already had a daughter. A second child did not survive, due to complications at the time of birth. He started his farewell tour in 2004, at the age of 69, performing one last time in old and new locations, after over 40 years on the stage. Pavarotti gave his last performance in an opera at the New York Metropolitan Opera on March 13, 2004 for which he received a 12-minute standing ovation for his role as the painter Mario Cavaradossi in Giacomo Puccini's Tosca. 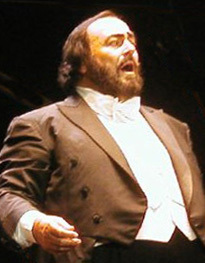 In March 2005, Pavarotti had an operation to his neck. His health began to suffer. He was diagnosed with pancreatic cancer in July 2006 and died of the disease on 6 September 2007 at his home in Modena, aged 71. ↑ "Pavarotti Dead At Age 71". CBS News. 7 September 2007. This page was last changed on 31 January 2017, at 05:47.